This recipe, which combines fresh goat cheese and mascarpone in a fondue-like melt, was part of a larger article about summer tomatoes in the Dining & Wine section of today's New York Times. It looks really easy and potentially very delicious. Leave a comment below if you decide to try it! 1. Preheat oven to 500 degrees. If necessary, slice a very thin layer off bottoms of tomatoes so they will stand upright. Core tomatoes, and carve them out, stopping about about 3/4 inch from bottom and sides. 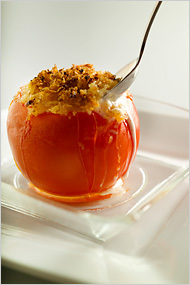 (Do not remove too much, or tomato will collapse when baked.) Season inside of each tomato with salt. In a small bowl, stir together mascarpone and goat cheese. 2. To prepare topping, melt butter with oil in a medium skillet over medium-high heat. Add garlic and anchovies, and cook, stirring, 30 seconds. Stir in bread crumbs, and sauté 2 minutes more. Season with pepper. 3. Fill each hollow with mascarpone mixture. Top generously with bread crumbs. Transfer tomatoes to a baking sheet, and bake until they are slightly blistered and the tops are golden, about 10 minutes.